In many schools in Europe athletes are supported on many different ways with the idea of combining secondary education and high performance sport. With the example of the sport cycling (street and track cycling) we want to compare the four educational systems. 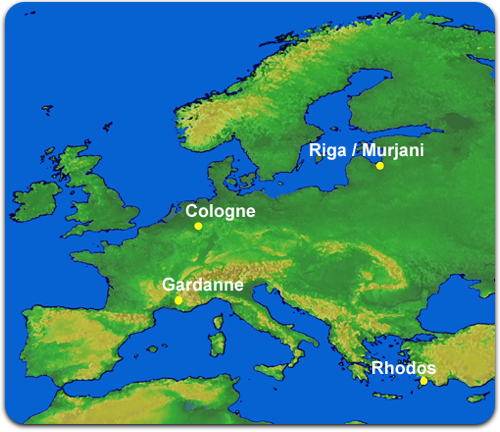 The partners are Gardanne (Provence) France ; Rhodos , Greece ; Riga , Latvia and Köln, Germany. All schools, which are engaged in the project, every one has built up their own program, in which the partners like governments, municipalities, sport clubs, associations and other institutions give their help. But different is especially the proceeding of selecting the pupils: some hold their own intensive talent scoutings - others only take already qualified high perfomance athletes. One of the schools is a boarding school, three are part-time boarding schools ( the pupils can eat at the school, but cannot stay overnight). This project was initiated and coordinated with the support of the Sport-Department, City of Cologne.